A bonafide Spectrum classic. 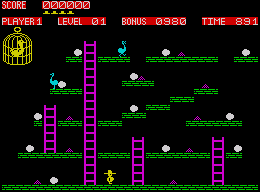 Chuckie Egg suffers from that age-old platform game problem, dodgy-ladder-detection, making it frustrating at times when a quick exit up or down a ladder is needed. Get past that and fun-a-plenty awaits!